Smart thermostats have flooded the market in recent years but there’s still only one that rises above the rest. We’re talking about the Nest Learning Thermostat, of course, which is still a cut above the rest in terms of design, features, and smartphone apps. The best often comes at price and that’s especially true of the Nest… but not right now. 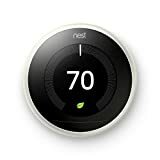 Nest’s beloved smart thermostat is on sale for Cyber Monday at its lowest price ever, matching Black Friday to the penny. Two colors have already sold out though, so grab one on sale while you still can.